Trusting your home remodeling contractor stems from how well you did your homework prior to hiring him or her. If all you did was call and hire the first home remodeling contractor you found in the phone book or on the internet your chances of a bad experience are quite high. This is not to say that every home remodeling contractor is a bad apple. It’s just that you effectively did nothing to ensure you found a truly experienced and professional contractor, and that was easy to work with. For example, I have hired highly skilled home remodeling contractors in the past, who truly knew their trade, but unfortunately lacked the interpersonal and communication skills to make the working relationship a positive experience. 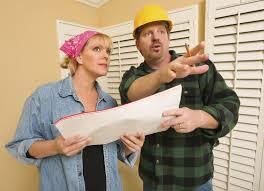 So if you want to find a home remodeling contractor that you can trust you need to follow a hiring process. The process should involve carefully screening several prospective home remodeling contractors so that you can find the best one for your project and your personality. There are four kinds of home remodeling contractors that you want to avoid at all cost. 1) The know-it-all home remodeling contractor, who over promises and under delivers. Usually this type of contractor is fast talking and has little supporting documentation in their home remodeling bid proposal. Sign a contract with him and get ready to be working for him. 2) The quiet and well intentioned home remodeling contractor who means well but simply lacks the experience and craftsmanship to do a quality job. Sign a contract with this type of contractor and expect to be leading him throughout the project and seeing mediocre work at best. 3) The over-priced home remodeling contractor who charges a premium for his work because he thinks he is the best in the business, but his actual work is underwhelming. Sign a deal with this type of contractor and you’ll be scratching your head as you look at his work and wondering why does he think he is so good. 4) The lowball home remodeling contractor who offers you a bid proposal well below the cost of the other bids. This type of contractor inevitably does either a poor job, slips schedules, and very often comes back to you with his hand open for more money. Accepting verbal quotes from a contractor as a binding bid proposal is the number one reason why homeowners end up losing faith and trust in the home remodeling contractor they hire. It is imperative that everything that is supposed to be done on the home remodeling project be included in the bid proposal. All specific materials to be used in the project should be included in the bid, along with all of the expected labor costs. Moreover, the bid proposal should be broken out into different stages. For example, in a new home construction project there should be construction stages that include: excavation, foundation, rough framing, electrical, plumbing, insulation, drywall, etc. Notice how I followed a flow of work that starts from the ground and works its way towards the finished home. This is the way every quality home remodeling contractor bid should flow. It’s easy to understand and it is more amenable to clearly showing costs for each stage of the project. Finally, a bid should include a schedule timeline for the overall project and for each stage in the project. 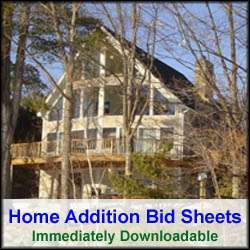 One useful tool that I offer on HomeAdditionPlus.com is home remodeling bid sheets. My bid sheets include a questionnaire to provide to prospective contractors for them to fill out. You can then compare completed questionnaires between prospective contractors. The bid sheet also provides important information about the specific project so you can better assess the questionnaire responses. In addition, the bid sheets include example cost and timelines for the specific home construction project you are intending to do. I have a wide selection of home remodeling bid sheets, including new home construction, room additions, kitchen and bathroom remodels, basement remodels, etc. So check them out at “Home Addition Bid Sheets”. Another major task that homeowners fail to do when hiring a home remodeling contractor is to fully vet out the prospective contractors. The vetting out process involves checking with the state and better business bureau to confirm the contractor is indeed licensed and has no history of bad customer experiences. The vetting out process also involves checking several references for each contractor. Reference checks are vital for confirming the quality of work performed by a contractor and how easy they are to work with. So by following the above prescribed advice you can go a long way in trusting your home remodeling contractor and ensuring a pleasant and successful home remodeling or construction project.